June 2 is an Italian national holiday for the Festa della Repubblica, or the Festival of the Republic. Similar to Independence Day in the US and other countries, it celebrates the official formation of the Republic of Italy after World War II. Banks, many shops, and some restaurants, museums, and tourist sites will be closed on June 2, or they may have reduced hours. If you plan to visit a site or museum, check its website in advance to see if it's open. Since the Vatican Museums are not actually in Italy but in Vatican City, they are open on June 2. Transportation services in most places run on the Sunday and holiday schedule, meaning there will be fewer buses, trams and metro trains running. Small festivals, concerts, and parades are held throughout Italy as well as at Italian Embassies in other countries, often followed by fireworks displays. The biggest and most spectacular Republic Day celebrations take place in Rome, the seat of the Italian government and residence of Italy's president. Republic Day is one of the top June events in Rome, and worh being in the city for. The city celebrates with a big parade in the morning, presided over by Italy's president, along Via dei Fori Imperiali, the street that runs alongside the Roman Forum. Expect huge crowds if you plan to attend the parade. A large Italian flag is usually draped over the Colosseum too. On Republic Day, the Italian President lays a wreath on the monument to the unknown soldier (from World War I), at the Monument to Vittorio Emmanuele II. In the afternoon, several military bands play music in the gardens of the Palazzo del Quirinale, the residence of the Italian President, which will be open to the public on June 2. A highlight of the day's festivities is the display by the Frecce Tricolori, the Italian Air Force acrobatic patrol. 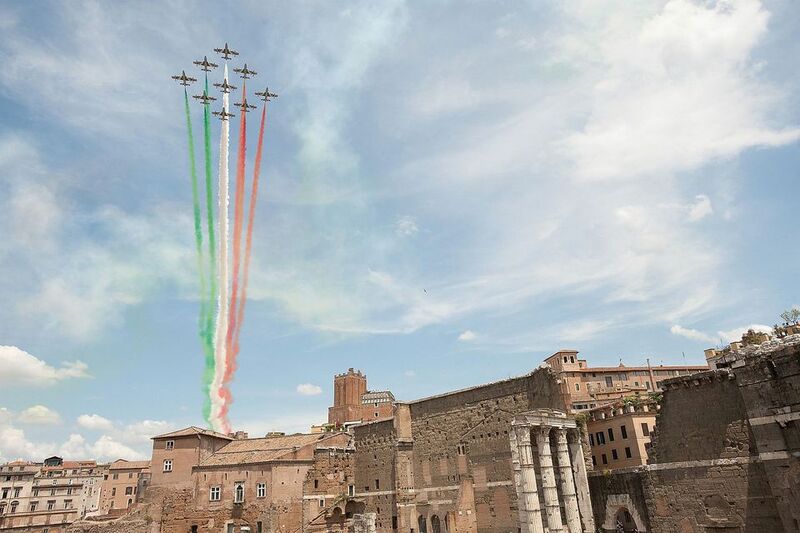 Nine planes emitting red, green, and white smoke fly in formation over the Monument to Vittorio Emmanuele II (the first King of unified Italy), creating a beautiful design resembling the Italian flag. The Vittorio Emmanuele II monument is a huge white marble structure between Piazza Venezia and the Capitoline Hill, but the Frecce Tricolori display can be seen over most of Rome. Republic Day celebrates the day in 1946 that Italians voted in favor of the republican form of government. Following World War II, a vote was held June 2 and 3 to determine if Italy should follow a monarchy or republic form of government. The majority voted for the republic and a few years later, June 2 was declared a holiday as the day the Italian Republic, was created. June is the beginning of the summer festival season and the outdoor concert season. June 2 is the only national holiday during the month, but there are many fun local festivals and events in June happening throughout Italy.